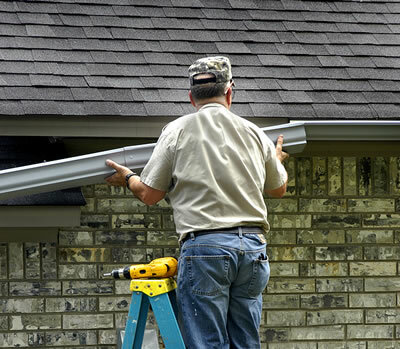 Carolina Roofing and Gutters specializes in gutter installations and servicing guttering systems for over 20 years. We use high-quality materials and we offer the best in customer service. We will provide whatever type of gutter installation you want - we are happy to give you our opinion on the best guttering system for your situation. A new gutter system with some kind of gutter or leaf guard will be virtually maintenance free - you just need to clean the outside of the system every year or so. Call us or fill out our Contact form to make an appointment to get high-quality seamless gutters installed on Your house or business building. We install gutters, guttering systems and downspouts in Smithfield. We are serious about using high quality gutters and downspouts - quality and making our customers happy is our main goal. This is our commitment - we are experts in the installation gutters. When you need gutter installation, leaf guard gutter protection or a gutter helmet system in the Smithfield area: Call Us: 252-883-9466. "Our customers tell the story in their reviews," said Scooter King, President of Carolina Roofing and Gutters. "We get on your project quickly, we get the job done and we are responsive to requests and concerns. Everyone says they give good customer service, but written reviews tell the real story." 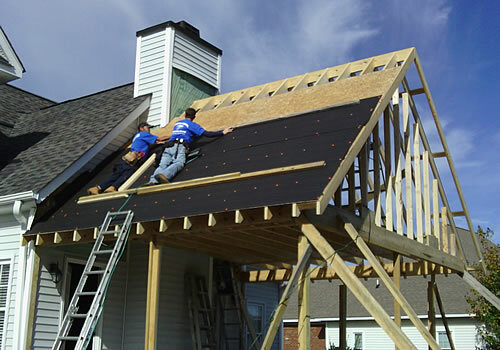 ROCKY MOUNT-GREENVILLE NC -- Carolina Roofing and Gutters LLC offers full roofing services for homeowners in Wake and Johnston counties all the way to Greenville. Carolina Roofing can do new installations, roof replacements or additions, like a sunroom roof.